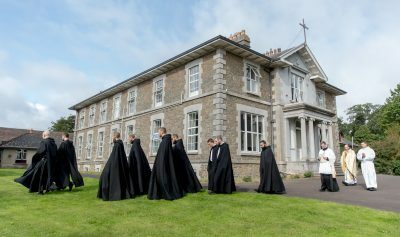 A dear friend of Silverstream Priory — the father of eight beautiful children— wrote me today, saying that large families were in need of of some encouragement. He sent me this text of Pope Pius XII and wondered if I might post it on Vultus Christi. This discourse was given exactly 57 years ago today, on 20 January 1958. Here it is. Beloved sons and daughters, Officers and Representatives of the Associations for Large Families-of Rome and of Italy, this visit of yours has to be listed among those that bring deepest pleasure to Our heart. You are well aware of the lively interest We have in family life, of how We never miss an opportunity to point out its many-sided dignity, to re-assert its rights and defend them, to inculcate the duties it involves—in a word, We make it a key-point of Our pastoral teaching. It is this same anxious interest in families that makes Us agree so readily to spend at least a few moments with family groups that come to Our home (whenever the duties of Our office do not make this impossible), and this is why, on occasion, We consent to be photographed in the midst of them, so as to leave some kind of lasting record of Our joy and theirs. The Pope in the midst of a family! Isn’t that right where he belongs? Isn’t he (in the loftiest spiritual sense of the word) the Father of the whole human family that has been reborn in Christ and in the Church? Is it not through him, the Vicar of Christ on earth, that the wonderful plan of creative Wisdom is put into effect — a plan that has conferred on all human fatherhood the destiny of preparing a chosen family for heaven, where the love of the One and Triune God will enfold them in a single eternal embrace and give them Himself as the inheritance that will make them perfectly happy? But you do not represent just any families at all; you are and represent large families, those most blessed by God and specially loved and prized by the Church as its most precious treasures. For these families offer particularly clear testimony to three things that serve to assure the world of the truth of the Church’s doctrine and the soundness of its practice, and that redound, through good example, to the great benefit of all other families and of civil society itself. Wherever you find large families in great numbers, they point to: the physical and moral health of a Christian people; a living faith in God and trust in His Providence; the fruitful and joyful holiness of Catholic marriage. We would like to say a few words about each of these points. Surely, one of the most harmful aberrations that has appeared in modern society with its pagan tendencies is the opinion of those who are eager to classify fruitfulness in marriage as a “social malady,” and who maintain that any nation that finds itself thus afflicted must exert every effort and use every means to cure the disease. This is the basis for the propaganda that goes under the name of “planned parenthood”; at times it is promoted by persons and organizations who command respect because of their positions in other fields, but who, unfortunately, have taken a stand in this matter which must be condemned. Sad as it is to realize how widespread doctrines and practices of this kind have become, even among the traditionally healthy classes, it is comforting to see indications and proofs of a healthy reaction in your country, both in the legal and in the medical fields. As you know, article 31 of the current Constitution of the Italian Republic, to cite just one source, pays “special attention to large families,” and the prevailing teaching among Italian doctors is along a line of opposition ever more strongly against birth-control practices. This does not mean that the danger has passed and that we have destroyed the prejudices which tend to make marriage and its wise norms submit to the aims of reprehensible pride and selfishness on the part of society or of individuals. We particularly deplore that section of the press that every so often takes up the question once again with the obvious intention of confusing good people and drawing them into error with misleading evidence, questionable polls, and even falsified statements from some cleric or other. On the part of Catholics, We must urge the wide dissemination of the principle, firmly founded on truth, that the only way to protect the physical and moral health of the family and of society is through whole-hearted obedience to the laws of nature, or rather of the Creator, and most of all by fostering a sacred, heart-felt respect for them. In this matter, everything depends on the intention. You can multiply laws and make the penalties heavier; you can give irrefutable proofs of the stupidity of birth-control theories and of the harm that comes from putting them into practice; but as long as there is no sincere determination to let the Creator carry on His work as He chooses, then human selfishness will always find new sophistries and excuses to still the voice of conscience (to the extent it can), and to carry on abuses. Now the value of the testimony offered by the parents of large families lies not only in their unequivocal and forceful rejection of any deliberate compromise between the law of God and human selfishness, but also in their readiness to accept joyfully and gratefully these priceless gifts of God—their children — in whatever number it may please Him to send them. This kind of attitude frees married couples from oppressive anxieties and remorse, and, in the opinion of outstanding doctors, creates the ideal psychological conditions for the healthy development of children born of the marriage. For, right at the beginning of these new lives, it eliminates all those worries and disturbances that can so easily leave physical or psychological scars on the mother or child. Apart from exceptional cases and We have had occasion to speak of these before — nature’s law is basically one of harmony, and it leads to discord and contradictions only in cases where its normal operation is upset by particular circumstances which are for the most part abnormal, or by deliberate opposition from a human will. There is no eugenics that can improve upon nature: it is good as a science only so long as it aims at gaining a profound knowledge of nature’s laws and respects these laws — although in some cases it may be wise to dissuade people who suffer from serious defects from getting married (cfr. Enc. Casti connubii, Dec. 31, 1930: A.A.S. 22 (1930) p. 565). Again, good common sense has always and everywhere looked upon large families as a sign, a proof, and a source of physical health, and history makes no mistake when it points to violation and abuse of the laws governing marriage and procreation as the primary cause of the decay of peoples. Far from being a “social malady,” large families are a guarantee of the moral and physical health of a people. Virtues flourish spontaneously in homes where a baby’s cries always echo from the crib, and vice is put to flight, as if it has been chased away by the childhood that is renewed there like the fresh and invigorating breath of spring. So let the weak and selfish take their example from you; let the nation continue to be loving and grateful toward you for all the sacrifices you have taken upon yourselves to raise and educate its citizens; just as the Church is pleased with you for enabling her to offer, along with you, ever healthier and larger groups of souls to the sanctifying activity of the divine Spirit. In the modern civil world a large family is usually, with good reason, looked upon as evidence of the fact that the Christian faith is being lived up to, for the selfishness that We just pointed out as the principal obstacle to an increase in the size of a family group cannot be successfully overcome without recourse to ethical and religious principles. In recent times we have seen how so-called “demographic politics” have failed to achieve any noteworthy results; it is easy to see why, for the individual interest will almost always win out over the collective pride and selfishness which this idea so often expresses, and the aims and methods of this policy debase the dignity of the family and the person by placing them on the same level as lower species. Only the divine and eternal light of Christianity gives full life and meaning to the family and this is so true that right from the beginning and through the whole course of its history, large families have often been considered as synonymous with Christian families. Respect for divine laws has made them abound with life; faith in God gives parents the strength and vigor they need to face the sacrifice and self-denial demanded for the raising of their children; Christian principles guide them and help them in the hard work of education; the Christian spirit of love watches over their peace and good order, and seems to draw forth from nature and bestow the deepest family joys that belong to parents, to children, to brothers and sisters. Even externally, a large, well-ordered family is a kind of visible shrine: the sacrament of Baptism is not an exceptional event for them but something constantly renewing the joy and grace of the Lord. The series of happy pilgrimages to the Baptismal font is not yet finished when a new one to Confirmation and first Communion begins, aglow with the same innocence. The youngest of the children will scarcely have put away his little white suit among the dearest memories of life, when the first wedding veil appears to bring parents, children, and new relatives together at the foot of the altar. More marriages, more Baptisms, more first Communions follow each other like ever-new springtimes that, in a sense, make the visits of God and of His grace to the home unending. But God also visits large families with His Providence, and parents, especially those who are poor, give clear testimony to this by resting all their trust in Him when human efforts are not enough. A trust that has a solid foundation and is not in vain! Providence — to put it in human words and ideas — is not a sum total of exceptional acts of divine pity; it is the ordinary result of harmonious activity on the part of the infinite wisdom, goodness and omnipotence of the Creator. God will never refuse a means of living to those He calls into being. The Divine Master has explicitly taught that “life is worth more than food, and the body more than clothing” (cf. Matt. 6, 25). If single incidents, whether small or great, seem to contradict this, it is a sign that man has placed some obstacle in the way of divine order, or else, in exceptional cases, that God has higher plans for good; but Providence is something real, something necessary since God is the Creator. The so-called problem of overpopulation of the earth is partly real and partly unreasonably feared as an imminent catastrophe for modern society; but undoubtedly the rise of this problem and the continued failure to arrive at a solution of it is not due to some mix-up or inertia on the part of divine Providence, but rather to disorder on man’s part — especially to his selfishness and avarice. With the progress that has been made in technology, with the ease of transportation, and with the new sources of energy that are just beginning to be tapped, the earth can promise prosperity to all those who will dwell on it for a long time to come. As for the future, who can foresee what new and unsuspected resources may be found on our planet, and what surprises may be uncovered outside of it by the wonderful scientific achievements that have just barely begun? And who can be sure that the natural rhythm of procreation will be the same in the future as it is now? Is it not possible that some law that will moderate the rhythm of expansion from within may come into play? Providence has reserved the future destiny of the world to itself. It is strange to find that the fears of some individuals are able to change well-founded hopes for prosperity into catastrophic spectre at the very moment when science is changing what used to be considered the dreams of wild imaginations into useful realities. So overpopulation is not a valid reason for spreading illicit birth control practices. It is simply a pretext used by those who would justify avarice and selfishness — by those nations, for instance, who fear that the expansion of others will pose a danger to their own political position and cause a lowering of the general standard of living, or by individuals, especially those who are better off, who prefer the greatest possible enjoyment of earthly goods to the praise and merit of bringing new lives into existence. The final result is that they break the fixed and certain laws of the Creator under the pretext of correcting supposed errors on the part of His Providence. It would be more reasonable and useful if modern society would make a more determined, universal effort to correct its own conduct, by removing the causes of hunger in the overpopulated or “depressed areas,” through a more active use of modern discoveries for peaceful aims, a more open political policy of collaboration and exchange, a more far-seeing and less nationalistic economy; above all, by reacting to all suggestions of selfishness with charity, to those of avarice with a more concrete application of justice. God is not going to ask men for an accounting of the general destiny of mankind; that is His business; but He will demand an accounting of the single acts that they have deliberately performed in accordance with or against the dictates of conscience. As for you, parents and children of large families, keep on giving a serene and firm testimony of your trust in divine Providence, and be assured that He will not fail to repay you with the testimony of His daily help and, whenever necessary, with those extraordinary helps that many of you have been happy to experience already. And now a few words on your third testimony — words that may give new strength to those who are fearful and bring you a little comfort. Large families are the most splendid flower-beds in the garden of the Church; happiness flowers in them and sanctity ripens in favorable soil. Every family group, even the smallest, was meant by God to be an oasis of spiritual peace. But there is a tremendous difference: where the number of children is not much more than one, that serene intimacy that gives value to life has a touch of melancholy or of pallor about it; it does not last as long, it may be more uncertain, it is often clouded by secret fears and remorse. It is very different from the serenity of spirit to be found in parents who are surrounded by a rich abundance of young lives. The joy that comes from the plentiful blessings of God breaks out in a thousand different ways and there is no fear that it will end. The brows of these fathers and mothers may be burdened with cares, but there is never a trace of that inner shadow that betrays anxiety of conscience or fear of an irreparable return to loneliness, Their youth never seems to fade away, as long as the sweet fragrance of a crib remains in the home, as long as the walls of the house echo to the silvery voices of children and grandchildren. Their heavy labors multiplied many times over, their redoubled sacrifices and their renunciation of costly amusements are generously rewarded even here below by the inexhaustible treasury of affection and tender hopes that dwell in their hearts without ever tiring them or bothering them. And the hopes soon become a reality when the eldest daughter begins to help her mother to take care of the baby and on the day the oldest son comes home with his face beaming with the first salary he has earned himself. That day will be a particularly happy one for parents, for it will make the spectre of an old age spent in misery disappear, and they will feel assured of a reward for their sacrifices. When there are many children, the youngsters are spared the boredom of loneliness and the discomfort of having to live in the midst of adults all the time. It is true that they may sometimes become so lively as to get on your nerves, and their disagreements may seem like small riots; but even their arguments play an effective role in the formation of character, as long as they are brief and superficial. Children in large families learn almost automatically to be careful of what they do and to assume responsibility for it, to have a respect for each other and help each other, to be open-hearted and generous. For them, the family is a little proving ground, before they move into the world outside, which will be harder on them and more demanding. All of these precious benefits will be more solid and permanent, more intense and more fruitful if the large family takes the supernatural spirit of the Gospel, which spiritualizes everything and makes it eternal, as its own particular guiding rule and basis. Experience shows that in these cases, God often goes beyond the ordinary gifts of Providence, such as joy and peace, to bestow on it a special call — a vocation to the priesthood, to the religious life, to the highest sanctity. With good reason, it has often been pointed out that large families have been in the forefront as the cradles of saints. We might cite, among others, the family of St. Louis, the King of France, made up of ten children, that of St. Catherine of Siena who came from a family of twenty-five, St. Robert Bellarmine from a family of twelve, and St. Pius X from a family of ten. Every vocation is a secret of Providence; but these cases prove that a large number of children does not prevent parents from giving them an outstanding and perfect upbringing; and they show that the number does not work out to the disadvantage of their quality, with regard to either physical or spiritual values. One last word to you, Directors and Representatives of the Associations for Large Families of Rome and of Italy. Be careful to imprint the seal of an ever more vigilant and fruitful dynamism on the action that you intend to carry out in behalf of the dignity of large families and for their economic protection. With regard to the first of these aims, keep in line with the directives of the Church; with regard to the second, you have to shake out of its lethargy that part of society that is not yet aware of its social responsibilities. Providence is a divine truth and reality, but it chooses to make use of human cooperators. Ordinarily it moves into action and comes to our aid when it has been summoned and practically led by the hand by man; it loves to lie hidden behind human activity. While it is only right to acknowledge that Italian legislation can legitimately boast of being most advanced in this area of affording protection to families and especially to large families, We should not close our eyes to the fact that there are still a considerable number of them who are tossed back and forth between discomfort and real privation, through no fault of their own. Your action must aim at bringing these people the protection of the laws, and in more urgent cases the help of charity. Every positive achievement in this field is like a solid stone set into the structure of the nation and of the church; it is the very best thing you can do as Catholics and as citizens. Calling down the divine protection upon your families and those of all Italy, placing them once again under the heavenly protection of the Holy Family of Jesus, Mary and Joseph, We impart to you with all Our heart Our paternal Apostolic Blessing.